The Future of Commerce: If You Live, You Win. New thinking: Instead of shopping or online stores, could “your best choices” always be part of every step you take? Short lead (247 out of 250 characters): With tomorrow’s continuous connections, embedded commerce will be aware of our steps and help us switch to what’s best. This 1-to-1 marketing will eliminate search, ads and retail. Immediate advances will be normal and elevate everyone to the top. Long lead (391 out of 400 characters): With tomorrow’s continuous connections, Active Knowledge will be embedded in everything we do digitally, aware and ready to help us succeed. Embedded commerce will help us switch to what’s best. This 1-to-1 marketing channel skips search, eliminates ads and bypasses retail. When our needs are known, instant solutions will be part of everyday life, constantly elevating everyone to the top. (Optional) AFTER the lead, BEFORE the first image: Chapter 2.3 from the new book, Imagine A New Future: Creating Greatness for All, asks: Instead of shopping or online stores, could “your best choices” always be ready and waiting? Chapter 2.3: The future of Commerce: If you live, you win. With tomorrow’s continuous connections, Active Knowledge will be embedded in everything we do digitally, aware and ready to help us succeed. Embedded commerce will help us switch to what’s best. This 1-to-1 marketing channel skips search, eliminates ads and bypasses retail. When our needs are known, instant solutions will be part of everyday life, constantly elevating everyone to the top. Imagine you’re surfing the world’s most powerful digital wave: You’re hot-dogging the leading edge of the future, checking out the action on what’s better, enjoying a service that helps you score as fast as you choose to rise. Want the most fun? Awesome! Want to be more productive? Zoom! Want to be happier? Go there! This service — Active Knowledge — instantly brings you knowledge of what’s best. It lets you switch to that immediately. Your ability to use your new option is guided. Your adoption speed, effectiveness and results blow your mind. You can equal the best anywhere. Even more powerful, you’re not alone. Imagine everyone surfing this wave of the future with you, the whole world pushing for a kick-out that lifts all our boards over the tops of our waves — together making this the best world it can be. The best we’ve ever been in history. You and everyone, surfing the waves that set us free to become what each of us wants to be. Could that be our future? How could we turn a corner, enter an accelerating world, and get stoked on weapons-grade advances? 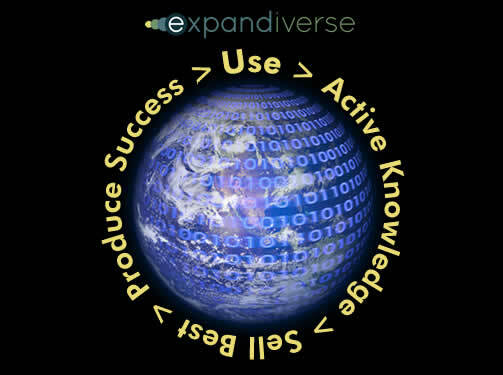 Welcome to the future of commerce in the Expandiverse. Its secret combines embedded commerce, continuous connections and Active Knowledge. Let’s visit the past for a minute, to see how today can turn into tomorrow. Ancient history is 1990, when we were stuck with payphones and landlines. If you wanted a microprocessor in your life you used DOS to run a green-screen PC or a heavy laptop. There were no browsers or websites. Networks were for corporations and universities. People used slow, loud modems that dialed up telephone connections — even AOL for Windows didn’t start until 1992. There wasn’t much to dial into. While drinking a coffee one morning, I was thinking about a world of the future where we would have many microprocessors around us. With many things digital, these devices would also add communications and turn interactive. 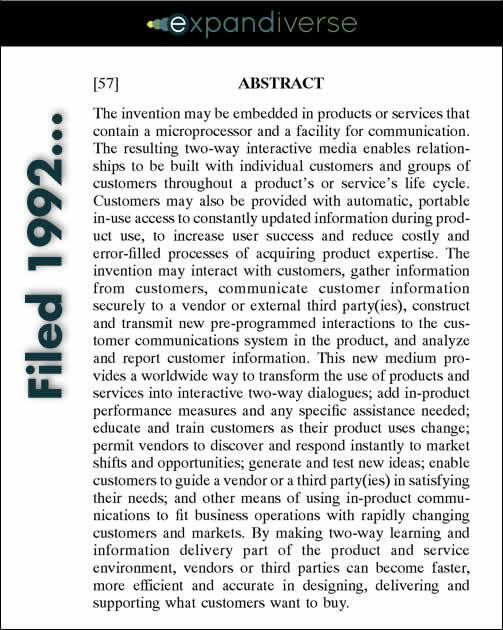 With two years of work, that seed grew into a digital communications patent whose abstract said, “The resulting two-way interactive media enables relationships to be built with individual customers and groups of customers throughout a product’s or service’s life cycle. This new medium provides a worldwide way to transform the use of products and services into interactive two-way dialogues. Of course that didn’t happen in the 1990’s, but it’s how we live today through our mobile phones and tablets, and in a growing range of other products and services. Filed in 1992, this patent went through an entire life cycle of waiting for the world to catch up, being bought, licensed hundreds of times by its new owners, and expiring. Today it’s old and free technology, available for everyone to use to live online and wonder about the future. Now let’s dive into tomorrow, which will feel as far out as today’s online world did 20 years ago. Except we’re advancing faster, and tomorrow could turn into today while we blink. The old model was physical retail stores. Get in your car, go to the store, find the products and learn about them by touching them and asking a salesperson questions. Today’s online e-commerce is on-screen. Use search to jump to the product, compare it to others, use reviews by customers and analysts, then find the best price and purchase. It’s spectacular for gift giving because presents are wrapped and delivered for you. Hours of work reduced to a few clicks. But e-commerce is still a baby, learning to walk as it adds mobile, showrooming, social (like Pinterest), communities and more. Amazon, it’s leader, keeps fighting to stay ahead by adding new Kindle devices, faster delivery from local warehouses, and instantly playable videos to sell immediately usable products. Tomorrow, online stores will be “yesterday’s” obsolete model. They start with customers having to “go” to them online. Then they stop at purchase and delivery. Their marketing lifecycle is only “find, buy and deliver.” That will be too short. The entire product lifecycle will soon enter the marketer’s sandbox: After buying, from “receiving through configuring through using through servicing and upgrading” — every minute of the life cycle enters marketing’s touchpoints. Every gap is an opportunity to make each customer the world’s best and happiest and greatest — during every minute he or she is awake. Embedded commerce will redefine marketing as full product lifecycle connections that are part of everything we do, aware of what we’re doing, knowing the gap between each of us and the world’s best, always ready to help everyone get what they need. After delivery, it shows you how to succeed while you use your new product or service, making satisfaction and success normal. Embedded e-commerce will tailor itself to all the steps in the product life cycle, holding your hand when you want, making sure you get what you expect. Awareness of everyone’s immediate needs. An embedded relationship, with an opportunity to help instantly during many tasks that include a screen or interactive device. User control over displaying Active Knowledge messages, forcing real contributions so they’re not turned off. The ability to show gaps and add improvements with an immediate transaction as soon as “more” is wanted. 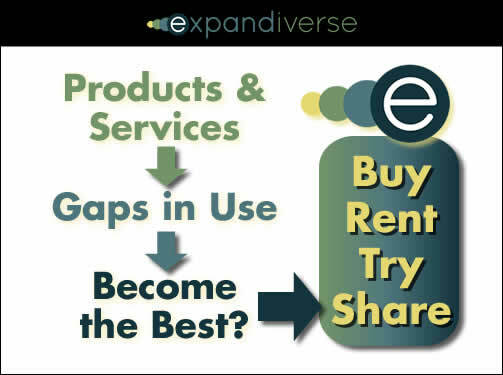 Multiple options so everyone advances at the cost and speed they want: Choices will include buying, renting, trying online, sharing or free use. Instant “delivery” of online products and services, including physical products that can be run right away by remote control — whether they are bought, rented, shared or used for free. A fast-adapting relationship that learns your personal goals and preferred touchpoints, then delivers tailored Active Knowledge that anticipates your needs when you’re likely to have them. Two-way loyalty and a “you” focus, because everyone can switch until they find the set of retail and vendor relationships that serve them best — then keep switching as they find better resources. Community sharing, with new and better Active Knowledge sources shared widely, producing the usual “winner takes all” growth rates of tech’s leaders. This new channel will move inside every part of our digital lives. It will be invisible to competitors: Search will be skipped (uh oh, Google), advertisements eliminated (Google again?) and online retailers bypassed (um, Amazon). 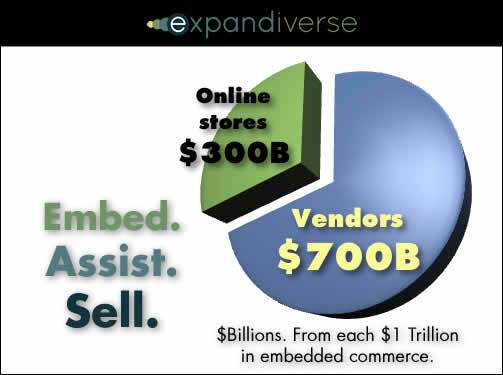 Embedded commerce connects vendors and customers at the moment of need, using one-to-one connections to build relationships and communities of successful and satisfied people worldwide. When some marketing departments do this well, watch out. Their companies’ sales will show it while their competitors will run screaming to catch up — before they’re shut out and shut down by failing to enter the future. A tipping point will arrive. Some companies will be in, some out. Some will rise up, some fall down. Some will turn fully alive (oh, what a world-spanning life), and some will… die. How will this work? 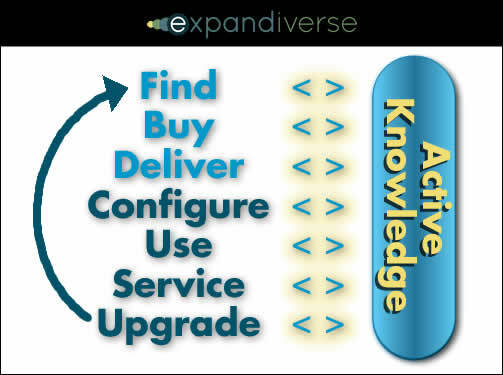 Start with other parts of the Expandiverse like your family of devices. You can turn away from your current screen, turn to your next screen and your digital world moves with you. It continues where you left off, with everything connected and open to the same steps. As your device “family” tracks you, it’s constantly ready to switch to your next device and screen, keeping you in a continuous digital world throughout your day. It’s also learning your gaps — the “triggers” where Active Knowledge could help you succeed — like the steps where you’re likely to fail or quit, or when you want more — so it’s able to step in with Active Knowledge when you’re likely to need it. Active Knowledge can also ask you to tell it your goals and priorities, so it knows the kinds of recommendations to offer. Then it learns from what you actually choose, which shows it what you really want (not just what you say you want) and how much you’ll really spend to get to your goals. It’s not just what’s best. It also sees what’s fun to you, and what makes you happy. But you’re just one member of this online world of billions of people. Next think of Active Knowledge that does this for everyone. The “big data” version of this tracking shows the success and failure rates of countless products and services. For each kind of goal, it shows the most effective products and services. It also shows the steps that produce the highest rates of success. As this service learns which “best” products and services to recommend for each goal and task, that becomes part of Active Knowledge. So are the steps generally taken to produce success. That’s what’s recommended to people who need — and want — to improve. It’s like GPS that follows travelers to their destinations. Which routes do successful people follow to reach their goals? Which products, services, tasks and steps produce the highest levels of success? Those are the top recommendations for others to use — and how to use them when they’re bought. It’s a new retail channel for everyone who has goals but wants a higher rate of success: They can try anything with their current product. Gaps trigger it, showing the steps and how to switch to better choices if wanted, with guidance in how to succeed. Over time this will produce embedded commerce that will make you and others more successful in achieving what you want. You’re always one step from the world’s best options if you’d like that — so you can switch when you decide. When you switch it guides you straight to the top, where you belong. Now you’re surfing the world’s most powerful wave. Except it’s a digital tsunami, driven by embedded commerce. The world’s best store has moved inside your screens, next to everything you do, always ready to serve as you do tasks, choose goals and decide — it’s time to reach for your dreams. It’s the same for everyone. Commerce will be embedded throughout tomorrow’s digital world, with all knowing Active Knowledge that’s ready to help all the time. Leading companies already work late into the night reinventing how we live, shop, play, communicate, read and work: Apple, Amazon, Facebook, Google and others transform our lives as they build their ecosystems and products. To reach ahead Apple is adding Siri, Goole is getting Now going, and Amazon’s Kindle HDX has a Mayday button for instant live support. Startups work late nights, too, building niches where they connect with customers to earn their share of the future. Suppose some leading companies and startups add Active Knowledge to help everyone succeed, as well as make this a better world? What’s their incentive to do this? Our digital world could grow to more than $1 Trillion in embedded commerce transactions, and is likely to reach many times that size. Like Apple’s iTunes store, Google Play or Amazon.com, each of these ecosystems could make their 30% or so of these embedded transactions. That would be a cool $300 Billion for each $1 Trillion of these types of individual and worldwide advances sparked by their ecosystem. If their Active Knowledge triggers AnthroTechtonic surges forward, the sales will grow faster. Imagine triggering surges toward people’s many unmet goals that produce $billions in worldwide sales. A rapidly improving digital world will be a highly profitable one. A new worldwide marketing channel might become how we find needs and deliver both improvements and surges forward. To elevate you and everyone. Everywhere. Hey, you want to go surfing this afternoon? I hear the waves are epic today. Image credits: The first graphic is credited to Shutterstock. All other graphics are copyright Dan Abelow.